Mix the first seven ingredients together in a large saucepan and bring to a simmer. Simmer for about 10 minutes. Turn the heat off and add the half and half. Let sit for 5 minutes and reheat gently. Serve with a dollop of sour cream to cut the sweetness. Children love this nutritious dish. For all ages, it’s fun to use a mug, piping a rosette of sour cream on top. Brown the meat in the oil on all sides in a large casserole with a lid or Dutch oven. Peel the carrots and potatoes. Cut the potatoes and onions into quarters and the carrots into 2 inch pieces. Mince the garlic. Layer the vegetables around the browned meat and add the thyme, salt, and pepper. Pour the beer into the casserole and bring it to a boil, uncovered, on the top of the stove. After it boils, turn the heat off and place the casserole, covered in a preheated 350 degree oven. Cook for one hour, remove and let cool. Refrigerate overnight. This tastes best when made a day ahead. Reheat in the oven and sprinkle with finely chopped parsley after arranging the sliced meat and vegetables on a warm platter. Serve the gravy separately. You may want to add some flour to thicken the juices on the top of the stove and adjust the seasoning. Grease and lightly flour a loaf pan, approximately 9 inches by 3-1/3 inches and set aside. Note: Do not preheat the oven. This cake goes in a cold oven. Cream the butter with the mace and salt. Gradually add the sugar and beat until fluffy. Add the eggs one at a time, beating well in between. Stir in the flour mix. The batter should be very smooth. Fill the pan and place the cake into the oven. Turn it to 300 degrees F. Check with a cake tester or broom straw after 1 1/2 hours. It should be done or close to done. Try toasting slices of Cambridge Tea Cake and topping them with fresh fruit, ice cream, or both. Beat the egg, milk, and melted butter together and add to the flour, salt, and pepper. Mix until smooth but do not over beat. Put the zucchini in a piece of cheescloth or a clean dish towel and squeeze out the excess liquid. Sauté with the shallot in two teaspoons of butter until soft, about 3-5 minutes. Add the zucchini mixture to the batter and drop the batter onto a well greased, hot griddle in rounds, approximately 2 1/2 inches in diameter. Turn when golden brown. Makes 36 fritters. Straight from the griddle, these are a nice accompaniment to a main course, fanned on the plate with grilled meat or fish. For Faith's wedding hors d'oeuvres, spread the room temperature fritters with salsa, topped with a dollop of sour cream or smoked salmon, or with sour cream and a twist of corriander or dill. The combinations are limitless, though, and these fritters may be made ahead and frozen. Preheat oven to 350°. Grease and lightly flour an eight-inch square pan. Melt the butter and chocolate in the top of a double boiler. Cool to room temperature. Beat the eggs and sugar together until they form a lemony ribbon. Add the vanilla. Fold the chocolate and butter into the egg mixture. Then fold in the flour, salt, and sour cream. Add the nuts if used. Bake for 30 minutes in the middle of the oven. Do not over-cook. Let cool for 30 minutes before cutting. Cooking at 325° will give you moist brownies, which Faith likes to do sometimes. This is a very rich dense brownie, silmilar in texture to flourless chocolate cake. It's sinfully good with ice cream on top. Makes 16 good-size brownies. If you double the recipe, you have to do it in two batches. Smoke the chicken on the grill, using hickory chips, apple wood, or any flavor you prefer. pinch of salt and pepper. Add the rosemary leaves and shake well. on the package, drain, and add the chevre, mixing it together thoroughly. mix gently. Salt and pepper to taste. served over greens as a salad. Serves 8-10, at least. squares together with the butter. Cool it slightly and beat in the sugar, eggs, and vanilla. Stir in the flour. Mix well, then add the cherries, walnuts, and chocolate chunks or chips. in the pan and serve. Makes a very generous 1 1/2 dozen. Note: Be careful not to over bake. actually the creation of the author's dear friend, Gladys Boalt of Stormville, New York. Dredge the beef cubes in flour (Faith does this the way her grandmother did by shaking the meat and flour in a brown paper bag). Melt the oil and butter in a large skillet and brown the meat. Sprinkle with salt and pepper. Pour the cognac, if being used, on top and carefully ignite. When the flames die down, transfer the meat to a casserole with a lid using a slotted spoon. Add the bacon, garlic, carrots, leek, onion, and parsley to the skillet. Sauté until the bacon is slightly crisp and the onions, garlic, and leeks are soft. You should stir the mixture frequently. Add the contents of the skillet to the meat. Add the thyme, Burgundy and just enough water to cover the stew. Cover and place the casserole in the center of the oven. Bake for 1-1 1/2 hours. Serve with egg noodles and more parsley as a garnish. This dish tastes delicious the day it’s made—let it rest for 10-15 minutes before serving—and even better if made a day ahead. Serves six. Cream the butter and sugars together by hand or with an electric mixer. Add the eggs and vanilla extract. Beat until fluffy. In a separate bowl, combine the flour, baking soda, and salt. Add to the butter mixture and stir or mix well. Stir in the chips and walnuts. Drop golf ball sized portions onto a non-greased cookie sheet. Bake in a preheated 325° oven for 15-20 minutes. They should be golden brown. Use the longer time for a crisper cookie. Cool on brown paper or racks. You can substitute the chips and walnuts with whatever comforts you or your family and friends —other chip varieties—they now have Reeses's and M&M chips, raisins, other kinds of chopped nuts. These are especially comforting when they're still warm and the chips haven't hardened. 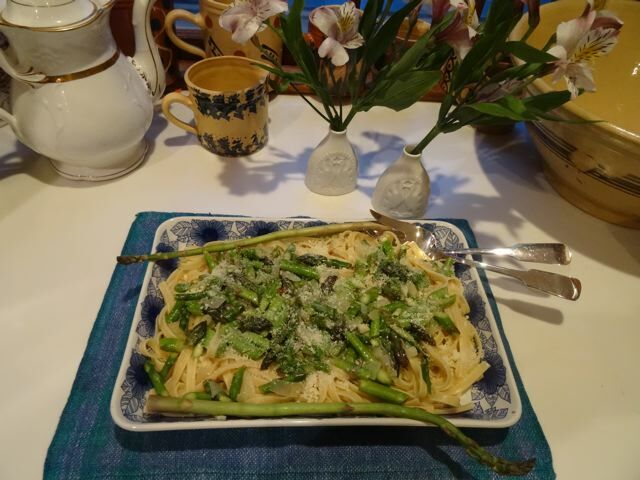 It's Spring and Faith's thoughts turn to asparagus and rhubarb! Break off the woody ends of the asparagus. Asparagus breaks naturally at this point. Hold a spear and bend it. It will snap at the point where it becomes too tough. Then slice the spear diagonally into approximately 1 inch pieces. Boil water for the pasta while you are sautéing the onion and garlic in the oil and butter until golden. Cook the pasta according to the directions on the package and drain, reserving 2 tablespoons of the cooking liquid. Add the asparagus to the onion/garlic mixture and cook for 2 minutes, stirring if necessary. Remove from the heat and add the water, wine, and lemon juice. Mix it with the pasta in a warmed bowl, adding the parmesan cheese, salt, and pepper to taste—or you may serve it mounded on top of each pasta portion. Serve immediately. Makes 4 portions. The butter may be omitted and replaced by olive oil. This is one of the best preparations for the first asparagus to appear in the spring, an elegant, yet simple recipe. Preheat the oven to 375° F. Toast the walnuts in a baking pan until lightly browned and aromatic. Let cool and coarsely chop. Combine the flour, oats, brown sugar, cinnamon, salt and stir to mix. Working quickly with your hands or a pastry blender, add the butter until the mixture has a crumbly texture. Stir in the chopped walnuts and set aside. Wash and trim the rhubarb and cut it into 1/2” slices (about 6 cups). Put the rhubarb in a large bowl and add the sugar and flour. Toss until the rhubarb is well-coated. Spread the rhubarb evenly into a 12” baking dish. Sprinkle the topping over the fruit and bake until the rhubarb is tender and bubbling, approximately 45 minutes to an hour. 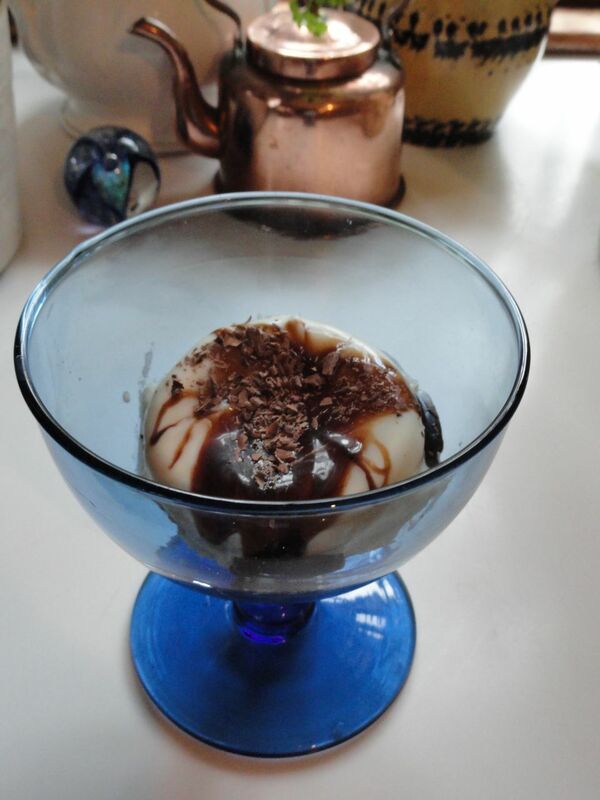 Serve warm with ice cream or whipped cream, if desired. Faith also makes this with strawberries, both fruits happily in season at the same time. You simply replace half or more of the rhubarb with halved berries. Combine the Madeira, 1/2 cup of the chicken broth, and the dried mushrooms in a small saucepan. Cover and bring to a boil, then set aside off the heat for 30 minutes. While the mushrooms are soaking, clean and slice the leeks. Dice the onion. Melt the butter is a large soup pot and saut� the leeks and onions until they are soft, about 10 minutes. Sprinkle the mixture with the flour and continue to cook for 5 more minutes. Add the remaining chicken broth, the beef broth, the fresh mushrooms, the dried mushrooms and their soaking liquid, the salt, and pepper. Simmer covered for 10 minutes, then uncovered for 20 minutes more. Cool the soup slightly and puree in batches in a blender or in the pot with an immersion blender. Return the soup to the pot and heat it through over low heat. Serve with a generous dollop of sour cream or cr�me fraiche. This makes a heart supper dish and will serve 6. As a first course or luncheon dish, it will serve 8. Making the soup a day ahead improves the flavor. 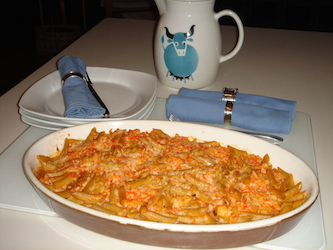 I am indebted to my nephew, David Pologe, for this recipe and to his late mother, Sheila, who first served it to me. Note on the recipes: As with all Faith's recipes, heart-wise substitutions can be made — egg beaters, margarine, low-fat milk and low-fat sour cream, for example, can be used in place of other ingredients. Time to shake off the Winter doldrums! Here are some new recipes for Spring. in the previous recipes section, or just click here to access this recipe in a new window. Note: the selection will change periodically, so copy these down while you can! Cut the chicken into strips, removing any fat. Dice the onion and slice the mushrooms. Heat 1 tablespoon butter and1 tablespoon olive oil in a large frying pan or wok and stir-fry the chicken. When done remove to a warm plate. While the chicken is cooking, melt 1 1/2 tablespoons of butter in a covered flameproof casserole. Add the flour and whisk to make a roux. Slowly add the chicken broth and stir until smooth and thickened. Add the sour cream and seasonings, stirring well. Sauté the onions and mushrooms in the same pan used for the chicken. You may need to add a bit more butter and olive oil. When the mushrooms are nicely browned, add the mixture to the sauce and fold in. Deglaze the pan with the wine and add to the mixture. Finally fold the cooked chicken in, cover, and simmer. At this point the dish may be served or refrigerated, brought to room temperature, and reheated the next day. Serves 4-6. Serve over egg noodles and sprinkle some finely chopped parsley on top of each portion. Notes: Replacing the chicken with beef, the chicken broth with beef broth, and nutmeg with dried mustard brings the dish back to its original roots. Look for endive that is fresh and a tight head. If you can, find the slightly purple variety, it’s nice to alternate the spears on your serving platter. Discard the outer leaf and cut a thin slice from the bottom to make it easier to remove the leaves. You may have to do this again. Save the small core of inner leaves for a future salad. Lightly brush the spears with the vinegar. Arrange the spears in a circular rows or any other way that is attractive on a serving platter or tray. Combine the two cheeses and half-and-half in a food processor and pulse until creamed together. Fill a pastry bag with the mixture and pipe about a tablespoon on the wide end of the spear. You may also spoon the mixture on the spear. Top with a walnut half. In season you can use pomegranate seeds or a piece of fresh fig. Dried cranberry is also good or a piece of candied ginger for a very different taste. You can prepare the cheese mixture ahead of time and refrigerate, bringing it to room temperature before assembling. Cream the butter and sugar. Add the egg yolk and beat until smooth. Add the flour, mix, then add the vanilla. At this stage, Faith uses her hands as the dough tends to be crumbly. Knead until smooth. Spread the dough in a greased 9x12 baking pan and place in the middle of a preheated 350 degree oven. Again Faith finds that it is easier to pat the dough evenly into the pan using her hands. Bake for twenty-five minutes and take the pan out of the oven. Distribute the chocolate/toffee bit mixture evenly over the cookie layer and bake for four minutes more. Remove the pan from the oven and immediately spread the melted chocolate/toffee mixture. Sprinkle what is now the frosting with the remaining toffee bits. It is important to let the cookies cool completely in the pan before cutting into squares. This is a decadently rich cookie and makes either twenty-four or thirty six cookies. It’s up to you. Slice the cucumbers as thin as possible, using a sharp knife or a food processor. One of my relatives uses a cheese slicer, an ostehøvel, “cheese plane”, which was invented by the Norwegians. When used with cheese, it produces one, thin slice of gjetost at a time—possibly all one may want. If you have a slicer, it produces a cucumber slice one can almost see through. Toss the cucumbers with 1 teaspoon salt, cover and refrigerate for at least 30 minutes. Drain the excess liquid. Combine the vinegar, sugar, salt, and pepper and pour over the cucumbers. Add the chopped dill and mix to be sure it is evenly distributed. Return, covered, to the refrigerator. Before serving transfer to a bowl with a slotted spoon and garnish with the dill sprigs. This will keep, refrigerated, for days. Preheat the oven to 325° F. Mix all the ingredients together and pour into a buttered baking dish. Set it in a pan of hot water, the water halfway up the sides of the dish, and bake until firm, approximately 45 minutes. Best with fresh corn, yet still a good side dish for a winter evening when elephant's eye high stalks are but a dream. Serves 4-6. People have very strong feelings about crab cakes. They're like barbeque—beef or pork? Catsup based or mustard based sauce? With crab cakes, the debate starts with the crab —Maryland, Louisiana, and Maine devotees weighing in on one coast; Washington on another. Faith loves all and any crab, but is partial to Maine's Peekytoe crab, because she lives there. Then, breading, crackers, or potato as binding? Worcestershire sauce, Old Bay, Tabasco or all three to complement the crustacean? Celery? Onions? The following is the recipe Faith's family prefers after many happy trials. The Fairchilds like their crab cakes crabby with as few additions as possible. Combine the mayonnaise, egg, and mustard. Mix well, then fold in the crabmeat and saltines. Faith puts the saltines between 2 sheets of waxed paper and rolls them with a rolling pin to crumble them. Let the mixture stand for about 3 minutes before shaping it into patties. This recipe makes 12 patties. Put them on a baking sheet, cover with waxed paper or Saran and refrigerate for an hour. Fry the cakes in vegetable oil, about 3-4 minutes on a side until they are golden brown. Drain on a paper towel and serve. Do not fry the cakes in olive oil or any other oil with a strong taste. Faith uses canola oil. For spicy cakes, add 1/2 teaspoon of hot sauce to the first three ingredients. Faith often serves her crab cakes with a dab of mayonnaise mixed with Old Bay seasoning to taste on the side. Preheat the oven to 400° F. Sift together the dry ingredients: flour, sugar, baking powder, salt, and spices. Lightly beat the eggs, milk, and melted butter together. Add this to the dry ingredients and mix. Fold the blueberries into the batter and fill each cup in the muffin tin completely, not 3/4. Faith learned this trick from Lori Boyce by way of Kyra Alex's cookbook, Lily's Cafe. Makes 2 dozen muffins. at home. Toss the apple cubes with the lemon juice to prevent discoloration. Then, stuff, alternating pieces of apple and prune. Preheat the oven to 350°. Put the butter and oil in a large casserole with a lid, a Dutch oven is good or Creuset-type cookware. Place the casserole on the tope of the stove over medium heat. When the butter has melted, add the loin, turning it so that it browns evenly on all sides, seasoning with the salt and pepper as you cook it. Remove the fat with a bulb baster. Pour in the wine and cook in the center of the oven for approximately an hour and a half. Use a meat thermometer to check to be sure it's done—but not overdone. Place the loin on a heated platter and finish the sauce by first skimming off any fat produced during the cooking, then bringing the remaining liquid to a boil. Reduce the heat and add the cream, stirring constantly. Serve the sauce separately in a gravy boat. A cranberry chutney or Scandinavian ligonberries go well with this dish. Serves six to eight. Heat milk and sugar, add butter and cardamom. When butter has melted, cool mixture to lukewarm. Add and dissolve yeast. Add salt, raisins, peel, if used, and beaten eggs. Work well together and add enough flour to make a firm but elastic dough. Cover dough and let stand in a warm place until doubled in bulk. Knead well and form into two round loaves -- or four standard sized bread loaves. Place on greased pie tins, or loaf pans and let rise until doubled again. Bake at 350° for 1 hour. Brush loaves with egg, vanilla mixture when they come out of the oven. Once you've made it, you'll get the knack. It needs to rise for a long time and you also have to watch that the top doesn't get too brown or burn in the oven. You may have to cover it with foil near the end. You can also make the dough in a braid. This Cardamom Raisin Bread is a Norwegian recipe from the real author’s grandmother. We’ve always made it for Christmas. In Norwegian, it’s called “Julekake”, “Christmas Cake. I now make it all year round. Put the milk, butter and egg into a mixing bowl and beat lightly. Sift the dry ingredients together and add to the liquid ingredients, stirring just enough to mix. Add the apple slices and stir. Cook on a griddle or in a frying pan, making sure that the apple slices are evenly distributed in the batter. Makes 16 four-inch pancakes. Serve with warm maple syrup—they don't need much. Mix the milk, melted butter, egg, and sour cream in a bowl until smooth. Sift the dry ingredients together in a separate bowl and add all at once to the liquid ingredients. Stir until moistened. The batter will be a bit lumpy. Add the vanilla and stir again. Fold in the berries. Makes 18-24 pancakes depending on size. You may also wish to add more fruit, but not too much or the pancakes get mushy. Delicious with syrup or without. Beat the eggs and add the sour cream, whisking well together, then add the butter, vanilla, and milk, whisking again. Add the dry ingredients and stir. The batter may seem thinner than your usual waffle batter. Cook in a preheated waffle iron, one that makes heart shapes is all the better. The finished waffle should be nicely browned. Makes approximately 2 dozen three-inch heart shaped waffles. Vafler are served room temperature with jam and butter, or sometimes powdered sugar. Never maple syrup. To vary the flavor, add 1/8 teaspoon of cardamom instead of the vanilla occasionally. Faith’s family likes dark meat, so she uses four whole chicken legs. Rinse and pat the chicken dry with a paper towel. Drizzle the oil in a casserole large enough to hold the chicken and vegetables. Faith prefers the oval ones from France, but Pyrex is just fine too. Place the chicken pieces in the casserole. Peel the parsnips, scrub (or peel) the carrots and cut both into chunks, about an inch long. Peel the onion and cut it into eighths. Arrange the assorted vegetables around the chicken. Strip the leaves off the sage stems. 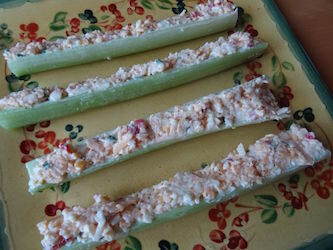 Roll them into a small cigar shape and slice into thin strips (a chiffonade). Sprinkle on top of the chicken and vegetables along with the salt and pepper. Pour the wine evenly over the casserole. Cover tightly with aluminum foil and bake for 1 hour. Uncover, baste with a bulb baster or a spoon and bake for another 45 minutes, basting occasionally. The chicken should be nicely browned. Let the dish rest for 5 minutes. Serves 4 amply. Be sure to spoon some of the liquid on top of the chicken and vegetables when serving. While the chicken is baking, start the potatoes. Faith figures 3 potatoes per person. Wash the potatoes, cut them in half, and steam them until you can pierce them with a sharp fork. About 15 minutes before the chicken is ready, sauté the potatoes in the butter and oil. Unfortunately a butter substitute does not work with this dish. Once the potatoes start to brown sprinkle them with the sage and add salt and pepper to taste. The potatoes will be done at the same time as the chicken and should be slightly crispy. Faith makes this basic recipe often to accompany meat, poultry, or fish, varying the seasoning. Rosemary is one of her favorites. Preheat oven to 350°. Grease and flour an eight cup kugelhopf or bundt pan. Beat butter in electric mixer until soft. Add sugar and beat to mix. Add eggs one at a time beating after each addition. On low speed, add sifted dry ingredients in three additions alternating with buttermilk, scraping bowl as necessary. Remove from mixer and stir in rinds and nuts. Pour into prepared pan, smooth top and place in hot oven. Bake for 55-60 minutes, until top springs back when pressed lightly. Remove from oven and set on rack. Place juices and sugar in saucepan and place over moderate heat and stir with wooden spoon until sugar is dissolved and mixture comes to boil. Remove from heat and add rum. Stir. Pierce top of cake with a cake tester. Spoon hot glaze over hot cake (still in the pan), spooning a little at a time. When you notice glaze oozing around the edge of the cake pan, use a metal spatula or knife to ease the edge of the cake away from the pan, allowing the glaze to run down the sides. Continue this until all glaze is absorbed. It will be absorbed, believe me. Let cake stand for 10 to 15 minutes, until bottom of pan is cool enough to touch. Then cover cake with a plate, hold the plate tightly in place against the cake pan and flip over the cake and pan. Remove cake pan from the cake. Let stand for at least two hours until cool and cover with plastic wrap. Can stand overnight before serving. Shred the cheese and set aside. Reserve 1/4 cup to sprinkle on top. Dice the peppers, mince the peeled garlic cloves, and place in a saucepan with the 1/2 cup of water. Bring to a boil and lower to simmer until the vegetables are very soft, about 15 minutes. Boil water for the pasta. Steam the cauliflower and when it is soft, transfer it to a bowl and mash roughly—you want some texture. Cook the pasta according to the directions on the package and in the meantime place the contents of the saucepan, the butter and milk in a food processor or blender. Pulse until smooth. Add the mixture to the cauliflower along with the shredded cheese, paprika, and salt. Drain the pasta and fold it into the sauce. Stir well so all the pasta is coated. Pour it into a casserole and top with the reserved cheese. Bake in a preheated 350 ° oven until nicely browned and bubbling. The red peppers give the sauce a bright color and the smoked paprika, widely used in Mediterranean cooking, adds a subtle flavor as well as more color. You may also serve this sauce over pasta without baking. Cover the bottom of 4 large (approximately 4” in diameter) ovenproof ramekins with 3-4 tablespoons of the melted butter. Place the peach, or other fruit, on top and set aside. Whisk the eggs in a mixing bowl and add the flour, milk, sugar, and orange juice, blending well. Add the reserved tablespoon of melted butter and mix well again. Divide the batter evening among the ramekins and bake on a baking sheet for about 20 minutes or until puffed and golden. Serve immediately. This is a very pretty presentation. The batter puffs up nicely almost like a popover. Faith adapted this recipe from a breakfast puff she had at the very charming Englishman’s Bed & Breakfast in Cherryfield, Maine. Many thanks to the hosts, Kathy and Peter Winham. ( Note: This recipe may be made with pears or apples. It is especially delicious with a mixture of apples, such as Empire and Delicious (sweet) or Macoun and Macintosh (slightly tart). Preheat the oven to 375�. Peel, core, and slice the fruit. Toss in a bowl with the lemon juice to prevent browning. Place the slices in a lightly buttered baking dish. Drizzle with the maple syrup. Put the flour, salt, sugar, and butter in the bowl of a food processor fitted with a metal blade and process briefly, or you may cut the butter in with a pastry cutter or two knives. Cover the fruit evenly with the flour mixture and bake for 45 minutes or until the juices are bubbling. Let sit for 5 minutes and serve with whipped cream, vanilla ice cream, or cr�me fra�che. Put the parsnips in a large saucepan and cover with water. Bring the water to a boil and simmer for about 10 minutes or until the parsnips are tender. Drain, return the parsnips to the pan and dry them over moderate heat. Shake the pan to thoroughly dry. Heat, but do not boil, the cream, butter, and broth. Puree the parsnips in a food processor with the warm cream, butter, broth mixture. Add the horseradish last. Increase the amount to taste. This is a wonderful any time of year dish, but especially as winter comfort food. It has also been a staple of our family Thanksgivings and is another of cousin Luise’s great recipes. Put 1 cup of the cream in a saucepan and sprinkle the gelatin on top. Let sit 3 minutes to soften the gelatin. Whisk and heat the mixture over low heat until the gelatin dissolves. Add the rest of the ingredients, stir, and heat over medium heat until the sugar dissolve, about 8-10 minutes. Do not boil. Pour through a sieve into a pitcher (easier to fill the ramekins this way) and then fill 6 ramekins that you have placed on a tray. Cover with a sheet of plastic wrap and refrigerate for 5 hours or overnight. 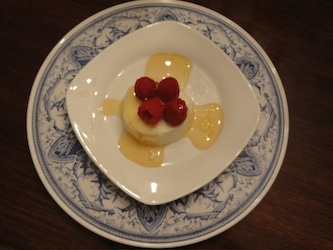 You can keep the panna cotta refrigerated for up to 2 days. To unmold, run a sharp knife around the edge of the ramekin and dip it in a flat pan of boiling water very briefly. 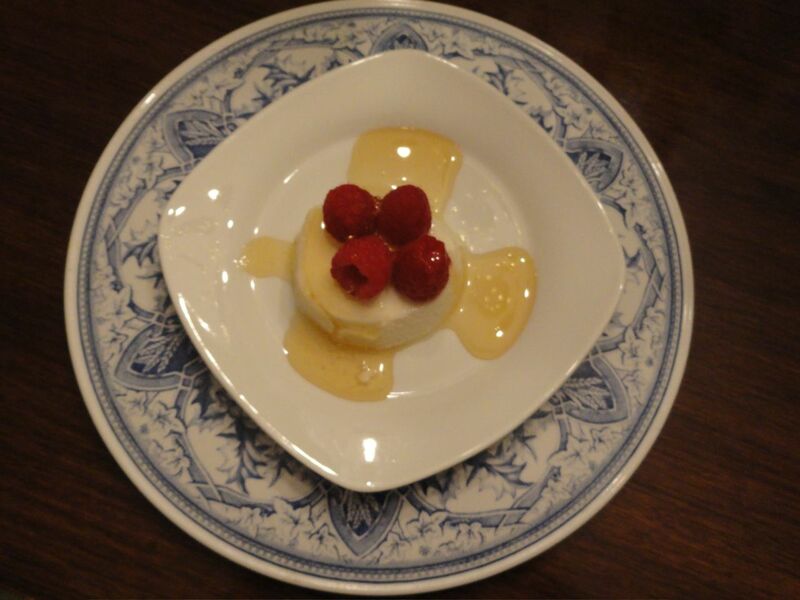 If you overestimate and the panna cotta looks runny, just put the ramekin back in the fridge to firm up again. Invert the ramekin over a small plate and serve. You may also pour all the panna cotta into a bowl, cover and refrigerate before scooping portions out into dessert bowls or martini-like cocktail glasses—very chic. Butter and lightly dust six 4 ounce oven-proof ramekins with flour. Gently heat the chocolate and butter in the top of a double boiler, stirring often. For a sweeter cake, use sweeter chocolate. Using a whisk or electric mixer, beat the eggs, yolks and sugar together until thickened and foamy. Beat the melted butter/chocolate mixture into the egg/sugar mixture and immediately add the flour, beating well to avoid air holes. Pour the batter into the ramekins. The dessert may be covered with plastic wrap and refrigerated at this point. Bring it to room temperature before cooking. Place the ramekins on a tray and bake in the middle of the oven for 10 minutes. The centers of the cakes should be very soft. Unmold on dessert plates and sift some confectioner's sugar on top. If your mussels are farmed or from a fish market where they have already been cleaned, your job is easier. Just be sure they are bearded, rinse them thoroughly, and discard any that are not closed. While you are doing this, bring the pasta water to a boil. Melt the butter in a pot with a lid large enough to hold the mussels, leaving some room at the top—the mussels will take up roughly 2/3 of the pot. Add the garlic, parsley, and thyme to the butter and sauté briefly. Be careful not to let the garlic brown. Add the mussels and pour the wine on top. Cover immediately. Cook the pasta. You want it all to come out at the same time—around 7 minutes. Drain the pasta and divide among four large heated soup bowls. 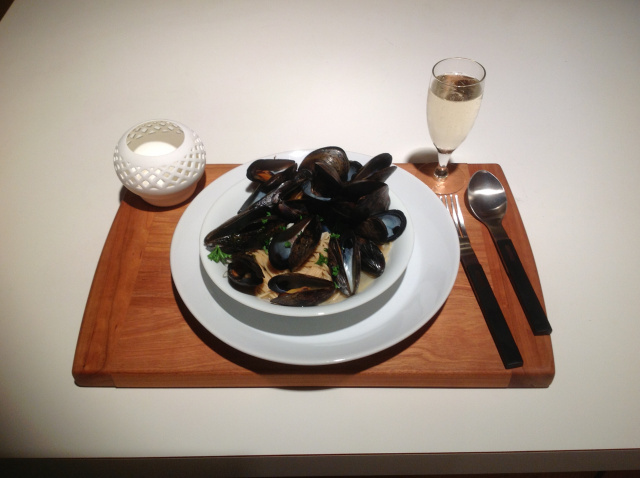 Spoon the mussels on top of each portion. Make sure all the mussels have steamed open. When you have finished, ladle the broth over each bowl. Some cooks strain the broth, but I like the bits of garlic and the parsley. Sprinkle each dish with the remaining parsley and serve with a side salad and crusty bread. You can do all sorts of things with this basic recipe: add lemon zest, fresh chopped tomato and/or chopped sausage—chorizo or linguica— to the pot before you put in the mussels and sauté. I also like to use whole-wheat pasta, which stands up well to the hearty mussel and garlic tastes. Heat the olive oil in a heavy sauce pan or stock pot and add the onions, carrots, celery and garlic. Stir and cook over medium heat until the onions are soft, approximately 2-3 minutes. Add the tomatoes and broth (if you can find these without salt or MSG, it's preferable). Bring the mixture to a boil. Add the sausage rounds. Reduce the heat, cover, and simmer for 20 minutes. Add the beans and pasta and cook, stirring often until the pasta is done, approximately 10 minutes. Season to taste with salt and pepper, remembering that the sausage may be salty. Add the basil and parsley. Serve with a sprinkling of cheese. Serves 6. You can prepared this ahead of time, stopping before the beans and pasta, adding those and the rest of the ingredients shortly before serving. This is a very easy, highly addictive dish. Simply mix all the ingredients together and it will keep in an airtight container in the refrigerator for up to a week. As mentioned in the book, it makes delicious grilled cheese; but is also great for other sandwiches, on crackers—traditionally the Keebler Club type— and stuffed into celery or other veggies. One of the cheeses has to be orange in order for it to be the real deal. Mrs. Eugenia Duke of Greenville, South Carolina created Duke’s Mayonnaise in 1917. It has more egg yolks and less sugar than other brands, which makes it tangier (it’s the South after all). Fry the bacon in a large skillet until crisp and remove from the pan. Drain on a paper towel and crumble. Saut� the onions, peppers, and garlic in the bacon grease until soft. Add the rest of the ingredients, including the bacon, and stir for about ten more minutes. Pour the mixture into a buttered casserole dish and bake until the liquid is absorbed, approximately 30 minutes. Red Rice comes to us from the Carolina and Georgia coastal Gullah or Geechee people from West Africa. There are many variations. Some recipes call for smoked sausage instead of bacon and add celery. Chef Joe Randall adds tomato paste and cooks the mixture on the stovetop. 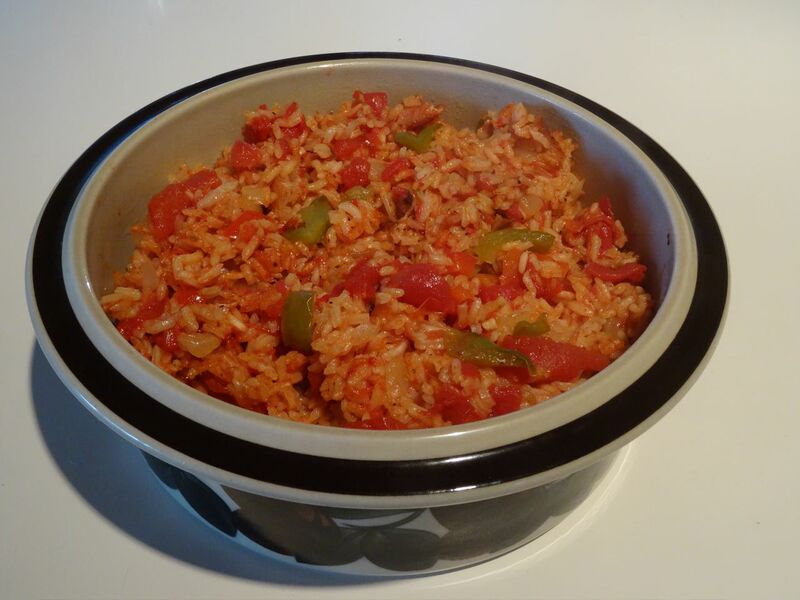 Other recipes cook the rice first, adding it to the pan and then baking it. The greatest variation comes in taste buds�the heat will increase the further south one goes! A versatile side or main dish, it is a treasured part of Southern culinary heritage. Steam or boil the potatoes until soft. Drain and puree using a food mill (sweet potatoes can be stringy). Set aside. Cream the butter, sugar, and spices by hand or with a hand mixer until light and fluffy. Beat in the eggs, half-and-half and vanilla. Add the potatoes and beat until smooth. Pour the mixture into the pie shell and bake for 40-50 minutes. 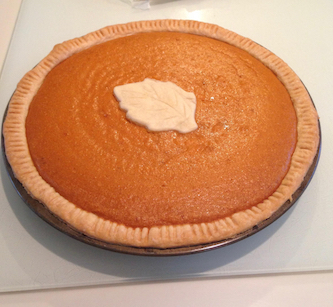 A thin knife or skewer inserted in the middle of the pie should come out clean. You may use light or dark brown sugar. Faith’s favorite pie crust recipe may be made in your food processor or by hand (use pie crust ingredients). If using a food processor, put all the ingredients in the bowl and slowly add the ice water with the motor running until you have a nice ball of dough. By hand, cut the butter into the dry ingredients and then slowly add the ice water. The sauce is listed as optional, because to many adding anything to a treasured sweet potato pie recipe is not only gilding the lily, but also downright blasphemous. However, this sauce is delicious on ice cream, pancakes, waffles, and all sorts of other concoctions. Plus every once in a while too much is just fine and you may want to spoon it over your pie. Combine the butter, sugar, corn syrup and half-and-half in a small saucepan and cook over low heat, stirring, until it is smooth—approximately 5 minutes. Remove from the heat. Add the vanilla and pecans. Stir and spoon over each serving. The sauce will keep in the refrigerator for a week. Place the potatoes in a large saucepan and cover with cold water. Bring to a boil and then turn the heat down to a simmer and cook for 10 minutes more. Add the apples and continue to simmer until the potatoes are done (check with a sharp fork) and the apples soft. Drain, reserving a little of the water. Put back on the heat and stir briefly to dry. Add the butter and mash. Faith relies on her old-fashioned potato masher. Add the honey, lemon, salt, and pepper and stir vigorously for a fluffy result. If the mixture is too dry, add a bit of the water. You may also serve the dish with crumbled crisp bacon and fried or caramelized onions on top. Granny Smiths or other tart apples give Himmel und Erde a nice sharpness, but any apples are fine. Nutmeg and thyme also give it a different sort of flavor as a change from the basic recipe. Garlic too. My friend Andrew Palmer, who is a wonderful cook, suggested this dish when I was asking for foods with some mention of heaven or hell in the name. A traditional German farm dish, it is a find. We’ve been having it as a side dish with pork, roasted chicken, and sausages. Cabbage in various forms has been a fine additional side.